The brutal, gladiatorial fight to the death between champions in Game of Thrones has reintroduced trial by combat to the cultural imagination. A long-outlawed practice in most places, it was once a core principle of Germanic law. Many Germanic tribes settled disputes with regulated fights, a method which later spread to Nordic countries in the form of ritual duels called Holmgang. While the notorious Game of Thrones duel made way for magical poisonings and horrific eye-gouging, real-life trial by combat followed strict rules. 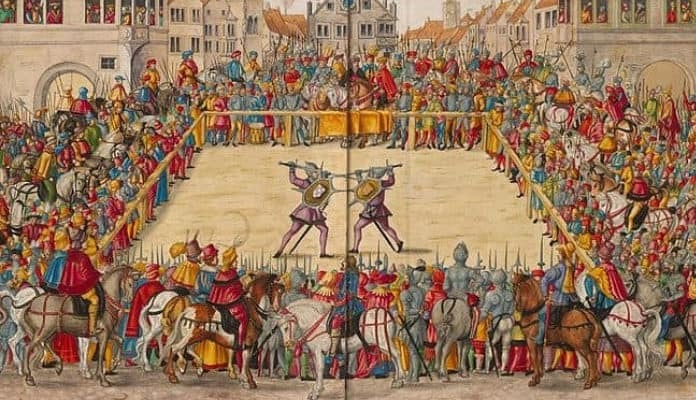 However, the public viewing of fights is true to the Game of Thrones fashion, with nations even building unique arenas to allow the public to view duels. A depiction of trial by combat in the Dresden Codex. Wikimedia. At the time of the US’ independence, in 1776, dueling was still a legal means of settling disputes in Great Britain. The United States automatically inherited British common law as a former territory, so dueling was technically legal when the US first became a nation. However, dueling was quickly outlawed in the new nation as the founders developed and codified new laws. By the time of the United States’ most notorious duel, between Alexander Hamilton and Aaron Burr in 1804, dueling was illegal. Aaron Burr was forced to flee after killing Hamilton with a pistol shot, as he could have been charged with murder. Requests for trial by combat still pop up in US courtrooms occasionally, as not all states have clear statutes that prohibit the practice. However, all such requests have been denied by judges. While some legal scholars have argued that modern forms of the method could be allowed, they have gained no wider traction. The most recent request was a tongue-in-cheek request for a duel in response to a civil suit, which was of course summarily dismissed by the presiding judge. The United States isn’t likely to allow Game of Thrones style gladiatorial style combat anytime soon.